An awesome set for a great price. Grab yours while stocks last and free gift. Unless anyone knows any better. My niece loves Lego, but I can't give her this. Boring, repetitive, boring.Unless anyone knows any better.My niece loves …Boring, repetitive, boring.Unless anyone knows any better.My niece loves Lego, but I can't give her this. It is repetitive but really fun build, and the details are amazing. Mines on display and it always turns heads. Epic set in my opinion. Each to their own really. Appreciate Lepin is a grey area and this will spark a few angry comments but people deserve to know that you can get this half price from AliExpress under the Lepin brand. I purchased my first Lepin product and it arrived two days ago and I'm massively impressed with the quality. Indeed they are being sued by Lego but Lego have their history of being sued and losing court cases themselves so you decide. Just beware though the parts come in sealed plastic bags and the instructions have a sticker covering the Lepin logo to get through customs. I had no customs to pay and it arrived in less than a week. Appreciate Lepin is a grey area and this will spark a few angry comments …Appreciate Lepin is a grey area and this will spark a few angry comments but people deserve to know that you can get this half price from AliExpress under the Lepin brand. I purchased my first Lepin product and it arrived two days ago and I'm massively impressed with the quality. Indeed they are being sued by Lego but Lego have their history of being sued and losing court cases themselves so you decide. Just beware though the parts come in sealed plastic bags and the instructions have a sticker covering the Lepin logo to get through customs. I had no customs to pay and it arrived in less than a week. These sell for £120-135 second hand. If you are ever thinking you might have a clear out, I doubt you could recoup nearly as much of your costs with Lepin. Yea.... Are you surprised that HOTUKDEALS has people trying to save money? To be fair , they are counterfeit yes but they provide the same joy to build. Sure some pieces out of the box may not be golden Lego quality. But in my humblest opinion you get 99% the same experience as normal Lego mainly a still enjoyable build and fun. They'll probably have some quality control but not to the extent of real Lego. And finally I think buying lepin one is going to realistically forfeit the customer support. But missing a few pieces on a set that cost usually half the price of the real thing. I'll get over that. And what is to say Lego pays tax properly? Just built lepin London bus. Cost 40 quid, no missing pieces, great fun, looks stunning. 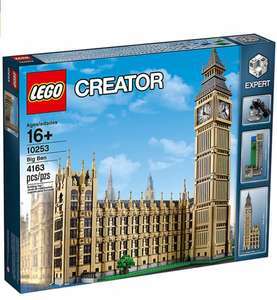 Would never ever have purchased the lego one, too expensive. You can sell it cheaper if all you do is copy other people's designs! Chinese exports such as this should be banned and Chinese authorities should be doing more to stop it. What I don't understand is why it's acceptable to mention Lepin in these threads, where in any other part of HUKD telling people where to buy counterfeit goods would surely be frowned upon? I mean, if every thread about a cheap Blu-Ray box-set had someone come in and post instructions where you could download it for free wouldn't that be an immediate ban? "It provides the same joy" though, doesn't it, so by that justification it should be allowed? No one is posting links to fake Chanel bags or perfumes. It's just LEGO, for some reason. What I don't understand is why it's acceptable to mention Lepin in these …What I don't understand is why it's acceptable to mention Lepin in these threads, where in any other part of HUKD telling people where to buy counterfeit goods would surely be frowned upon?I mean, if every thread about a cheap Blu-Ray box-set had someone come in and post instructions where you could download it for free wouldn't that be an immediate ban? "It provides the same joy" though, doesn't it, so by that justification it should be allowed? No one is posting links to fake Chanel bags or perfumes. It's just LEGO, for some reason.Nonseeeense. It's not counterfeit, it's genuine... Lepin. Not Lego branded. Ever seen hi street brands copy designs of branded hand bags or clothes? Like every single chain... More accurate comparison. It's not counterfeit, it's genuine... Lepin. Not Lego branded. Ever seen …It's not counterfeit, it's genuine... Lepin. Not Lego branded. Ever seen hi street brands copy designs of branded hand bags or clothes? Like every single chain... More accurate comparison. Agreed, if it had lego logos, then it would be counterfeit. It doesn't so its a clone. Unless, specific patents are breached or PROTECTED IP is stolen, clones are not illegal.